Mr. M. A. Karim, Managing Director of Palli Karma-Sahayak Foundation (PKSF) recently exchanged Eid greetings with H. E. Mr. Md. 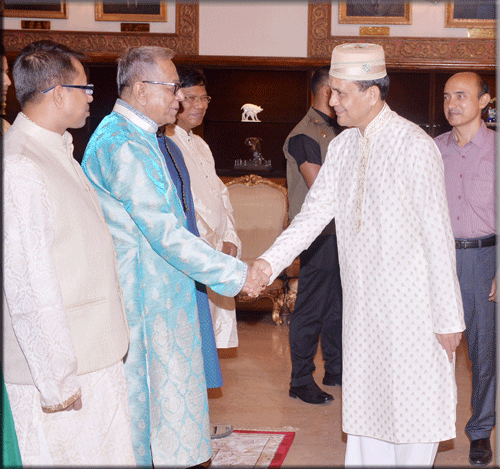 Abdul Hamid, Hon’ble President of the People’s Republic of Bangladesh at Bangabhaban, Dhaka. The Hon’ble President invited the Ministers, Judges, Members of Parliament, Ambassadors/High Commissioners, intelligentsia, high Civil and Military Officers etc. on the occasion of the holy Eid. Mr. Karim wished the Hon’ble President long, happy life and requested for his blessings for the Palli Karma-Sahayak Foundation (PKSF).